Astro Malaysia Holdings Berhad is a leading Malaysian conglomerate which has a strong presence in the field of consumer media entertainment in all of South East Asia. Aside from its corporate profile, the company is an enthusiastic champion of marine conservation. The Astro group has long being involved in various community service efforts in Sabah. The group launched its first marine conservation effort in 2011. This first Astro Kasih ‘Beautiful Malaysia’ project sought to draw attention to the fact that oceans around the world are dying due the polluting habits of us, humans. The group’s first endeavor resulted in the successful transplant of 777 individual corals at Ribbon Reef located within the Tun Sakaran Marine Park in Sabah. This hugely successful effort broke the previous record which featured the transplant of 501 individual corals. The effort was thus entered into the Malaysia Book of Records. 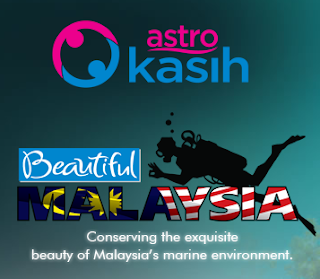 For its second marine conservation effort, the Astro group invites certified divers to take part in an attempt to establish a new Guinness World Record for the Longest Underwater Clean Up at the Tunku Abdul Rahman Marine Park in Kota Kinabalu, Sabah. The event is scheduled to be held over a week from the 6th to the 13th April 2013. In order that a new Guinness world record, be established the divers taking part in the effort will have to dive for a minimum of 168 hours and perform a continuous clean-up activity. This gargantuan effort will be held at 14 dive sites around the Tunku Abdul Rahman Marine Park in Kota Kinabalu. · The company encourages certified divers to take part in this huge cleanup effort. However divers desirous of joining the project are expected to possess a diving certificate from a recognized diving agency such as PADI, NAUI, CMAS, BSAC or SSI with a minimum of 20 day dives (Open Water) or 10 night dives (Advanced Open Water). · Each participant will be expected to perform a maximum of three dives per day or night. As the requirements for establishing the Guinness World record state that it needs to be a continuous clean-up activity, participants are expected to dive at nighttime and also during adverse rainy conditions. · Each clean-up team will feature a minimum of 2 divers, of which one will be a professional dive guide/instructor. · Each dive is fixed to last for 40 minutes and the maximum depth of each dive is expected to be approximately 14 meters (45 feet). · The surface interval between dives will be approximately two hours and during this time the diver will be able to rest on a base boat or on a beach where food and drinks will be provided. · The divers are expected to use their own equipment for their dives though the company will provide divers with scuba tanks, weights and weight belts. · The clean-up effort itself will involve removing matter that doesn’t intrinsically belong to a coral reef like plastic, rubber, cloth and paper. Divers will not be expected to extract heavy objects or even objects that have gotten fused with the reef. · Once the pollutants have been removed, they will be sorted, classified and catalogued before they are given to the appropriate authorities for disposal. · On the successful completion of the effort, each diver will receive an Individual Guinness World Records certificate for his/her work. · A Grand celebration party will be held to celebrate the success of the event on April 13th during which selected divers will be awarded with various attractive prizes. All corporate entities should be inspired by the Astro groups lead to initiate endeavors that make our world a better place to live in. Many giant corporations have the means and the power to truly make a difference don’t you think?